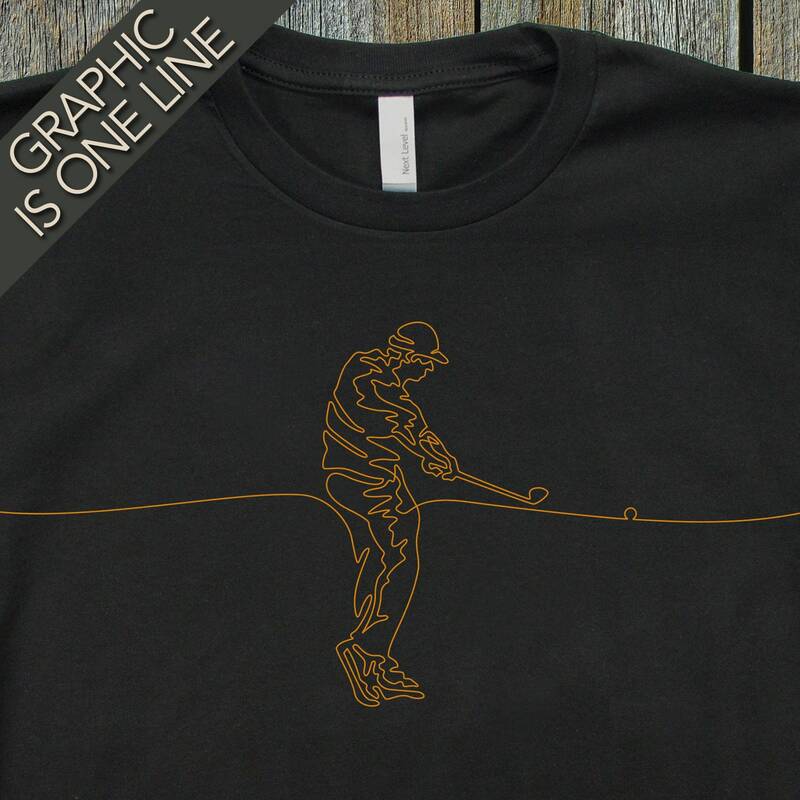 THE GOLFING GRAPHIC IS A SINGLE LINE DRAWING! 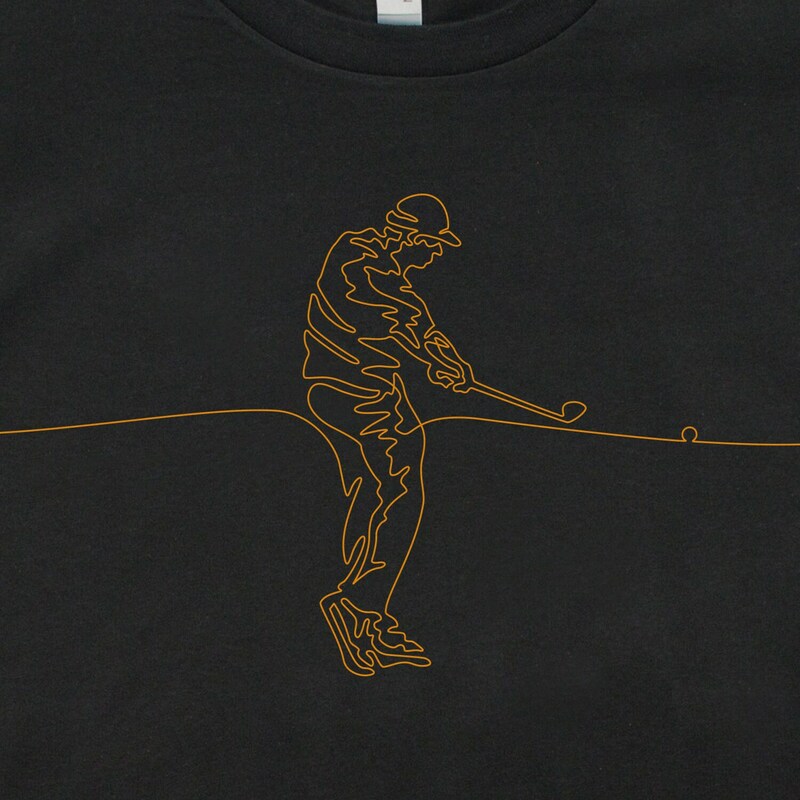 Stylish and sophisticated, this golfing T-shirt will catch the eye of those around you. 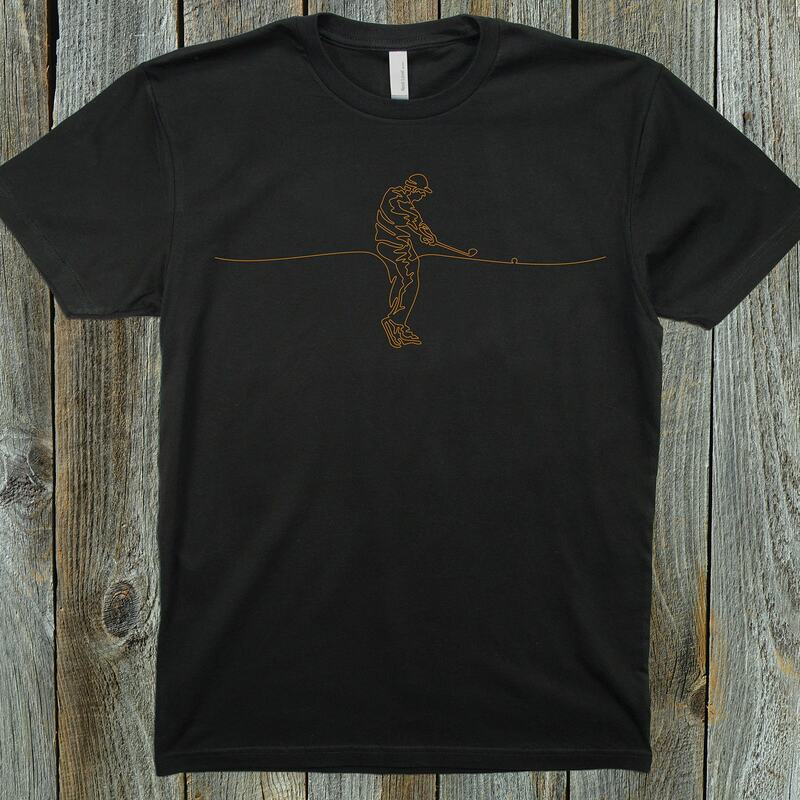 It’s a great way to showcase your passion for golf while making a unique fashion statement at the same time. DESIGN — As a graphic designer, I strive to create work that is simple, direct and memorable. “Say one thing and say it well” is my mantra. Working commercially for many years, I always dreamt about bringing one-of-a-kind graphics to the consumer market. That was the genesis of Fun Line Designs Graphic T-shirts. I hope you like what you see! PRODUCT — Made of 100% combed ring-spun cotton, this premium tee is soft, lightweight and very comfortable to wear. Available in sizes Small, Medium, Large, XLarge and XXLarge, the men’s tees are fitted and do run a tad bit smaller than bargain brand tees. 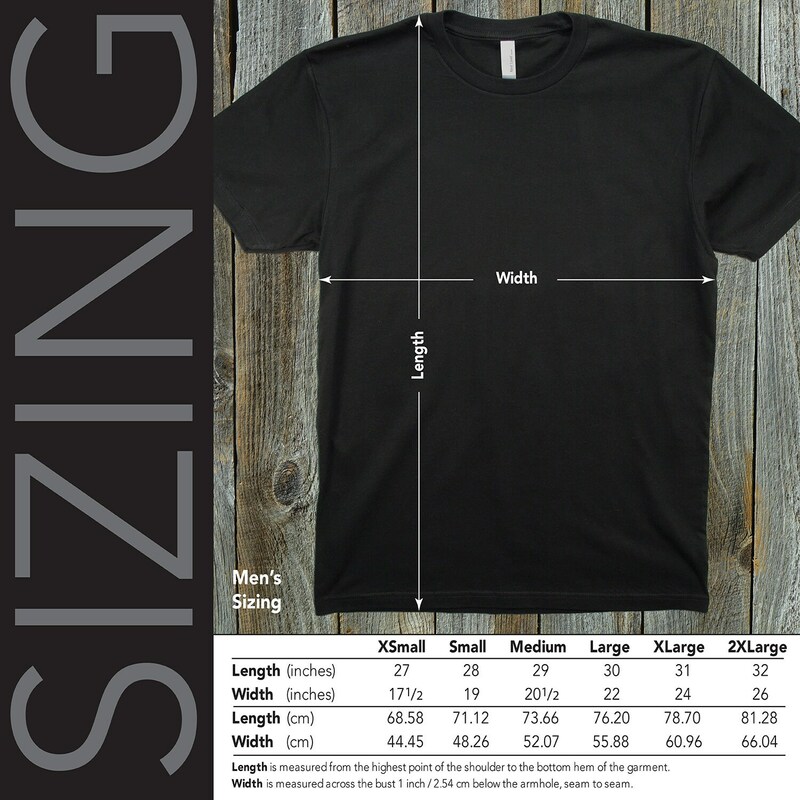 Please refer to the sizing chart to insure you order the correct size. The graphic is screen printed with three hits of a Plastisol® ink making the image extremely durable. The tees are not pre washed. All 100% cotton tees will shrink. To minimize shrinkage, machine wash the tee inside-out in cold water with like colors. Line or tumble dry at a low temperature setting. Do not use bleach and try to avoid ironing the graphic with an overly hot iron. The shirts I use are Next Level® tees — a top-quality brand that are manufactured overseas in WRAP® (Worldwide Responsible Accredited Production) factories. Factories holding this certification promote and follow safe, lawful, humane and ethical manufacturing practices and pay their employees fair wages. Of course I orchestrate the screen printing. PROCESSING — Once an order is placed, it will take 1-2 business days to process. Each tee is thoroughly inspected before packaging and shipping. SHIPPING — The cost of shipping a tee via USPS is $3.50. Additional tees within an order are shipped at $1.50 each. Tees are shipped first class and usually arrive in 2-3 business days depending on your location. I do not ship overnight. RETURNS — If you are not completely satisfied with your tee, or you need to exchange it for a different size, that is not a problem. You must contact me within 14 days of receiving your order and let me know why you need to return the T-shirt. The tee must be in its original selling condition. This means it can not be laundered and must be void of all foreign odors such as perfume, cologne, cigarette smoke, food, etc. If the returned shirt does not meet these conditions, the offer to exchange or refund the purchase will be voided. Customers are responsible for return shipping costs. Feel free to contact me if you have questions relating to returns and/or exchanges. RETAIL DISCOUNTS — If you are a small retailer and are interested in buying T-shirts in bulk quantities, please contact me to discuss wholesale pricing. Please be aware my tees can not re-branded or reworked in any way, shape or form.